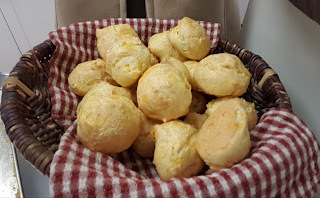 In French, they are called gougères (goo-zjere'). Traditionally made with gruyère cheese, any hard dry cheese will do fine. They are good just like this, or pop them open and scoop in a filling such as chicken salad or shaved ham. I often take them to potlucks. A few years ago, I made gougères on Global TV ~ if you'd like to see the process I'll put the link below. In a saucepan, heat the water with the butter, salt and pepper until the butter is melted and the water is just simmering. Dump in the flour all at once. Stir vigorously until the mixture pulls away from the sides of the pot and forms a ball. Remove from heat. Beat the mixture with electric beaters (or turn it into a stand mixer) for 30 seconds to release some of the heat. Rest two minutes. Add the eggs one at a time, mixing quickly and thoroughly between each egg. Mix the two cheeses together and beat into the dough. Using a small spoon, scoop up walnut-sized balls of dough and place on a baking sheet. One rounded scoop of a tablespoon is a good amount of batter. It helps to wet your finger in order to push the batter onto the baking sheet without sticking. I keep a glass of water by the bowl and dip my finger with each scoop. Sprinkle each one with a bit of extra parmesan cheese. Bake at 425F for 10 minutes. Turn the heat down to 375F and bake another 20-25 minutes. Puffs should be lightly browned. Eat warm or cool.